The first time that I saw a movie that was set in the 1980s, as a period piece, with appropriate costumes, etc., I was amused. Nowadays, I see them all of the time. And as someone who was alive in the 1980s, I can easily see how accurate they are, or aren't. And mostly the movies I've seen that are supposed to be set way back in the 1980s are correct, but the one thing that I see wrong over and over is how men more their jeans. Correct length for modern day, wrong for the 1980s. 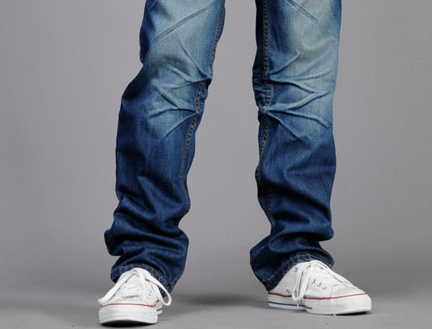 For the past twenty years, men have worn their bluejeans very long. That is, instead of just a slight break on the instep, like like the photo of the guys from the 1980s at the top of this post, they are worn all bunched up at the bottom, which is correct for the 21st Century. 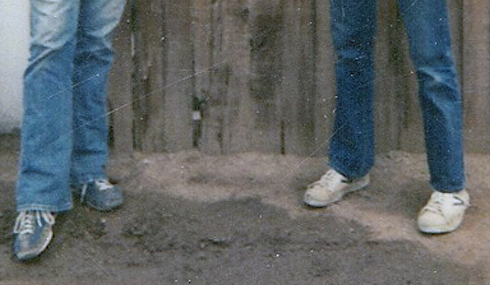 In the 1980s, if you wore jeans that were so obviously the wrong length that they bunched up like crazy at the bottom, you looked ridiculous. Kind'a like wearing your dad's jacket, if it was way too big for you. Of course, you didn't want your jeans to be too short (which were called "high waters"), but you didn't want them so long that they dragged on your heels, or bunched up. The "all bunched up at the bottom" style of wearing bluejeans has been around so long that showing men wearing bluejeans of the correct length in a 1980s period movie would look ridiculous to most people nowadays, so maybe the movies aren't doing it wrong, maybe they just don't want people to be giggling.